A beautiful gold plated silver necklace set with green onyx and red spinel stone placed symmetrically giving it a royal look. A touch of modern and Indian, this beautiful floral necklace is perfect to match with an indo-western Saree. 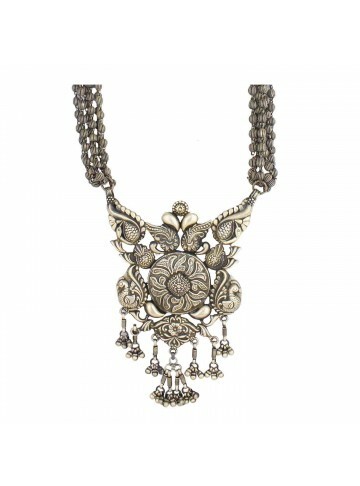 Goddess Laxmi depicted beautifully in this antique silver necklace. Pair it with a traditional saree and look elegant. 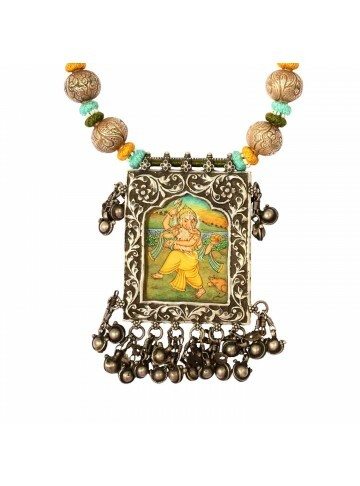 An elegant piece of necklace eith hand-painted Ganesha on the side. Evergreen and the best part it can be matched with any color. 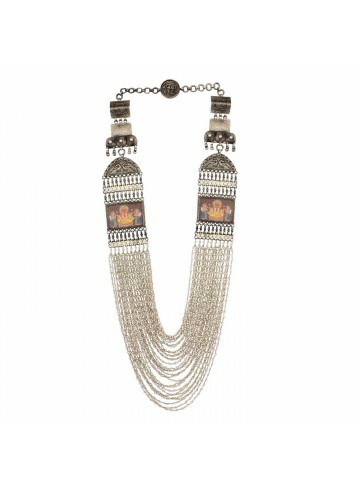 A true stunner, this tali necklace with two peacocks on the side and beaded pearls is a sure head turner. Wear it to a wedding with your traditional sarees and you’re sure to make a statement. Two beautiful lotus placed on either side in this traditional silver necklace. The pink spinel stone gives a touch of elegance. An inverted triangle with turquoise stones and a gold beaded chain gives this necklace a royal look. 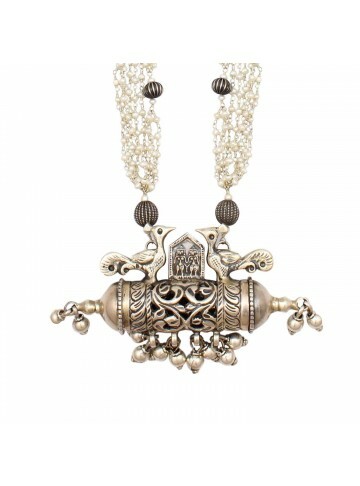 Handcrafted in 925 silver, this necklace depicts royalty. A lovely enamel pendant with an elephant drawn on it with black onyx tassels and a square garnet stone in the centre. Truly a masterpiece, this necklace will match perfectly on a saree for a night function. A nice western pendant with zircons in gold plated silver in a sleek design. Wear it to office or on a casual date and you're sure to love it. A lovely blue beaded chain with floral meenakari work in a reversible style with light and dark blue colours. Truly elegant and timeless in design! A sleek and trendy silver chain plated in gold interspersed with teardrop shaped beads. Don't miss the meenakari work on the beads. This chain is reversible giving you two options to wear. A lovely silver chain gold plated with oval beads interspersed in between. It's reversible so you can wear it on the lighter or darker green side. Truly elegant and a master piece for sure. A masterpiece for sure, this ruby necklace with tiny enamel work jhumkas, a classic thewa pendant, and lapis beads is sure to make heads turn at a wedding. Wear it with a lighter toned saree to accentuate your look for a wedding. A lovely shaped tree pendant with meenakari work and white pearls gives this a very elegant look. Perfect to match with any outfit this Diwali! A trendy chain made in silver and gold plated with a red enamel disc pendant. Perfect to wear with your westerns! 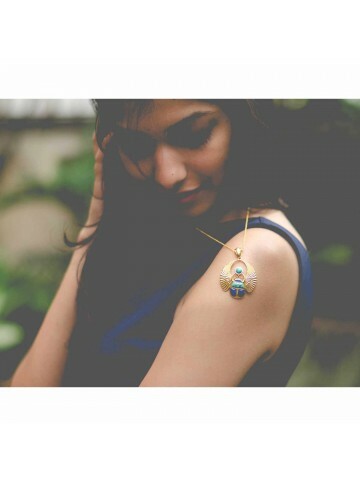 A contemporary take on Meenakari, this enamel disc pendant with navy blue enamel work is perfect to wear with your westerns. Handmade beautifully in 925 silver and gold plated, you will love owning this one. Don't miss the small gold floral pendant on the sides. A beautifully handcrafted pendant in gold plated silver with intricate floral work, zircons, sea blue enamel and lapis stones. You cannot find a master piece like this one! Wear it with a saree or a dress, this pendant is sure to make heads turn. Match it with our cute floral drop earrings. All designs in our collection have been inspired from Ancient Egypt and combined with modern motifs giving it a contemporary appeal. The most wanted necklace from our Egyptian collection. This gold plated necklace handmade in 925 Silver is a true depiction of the Egyptian God of the Sky, the falcon. 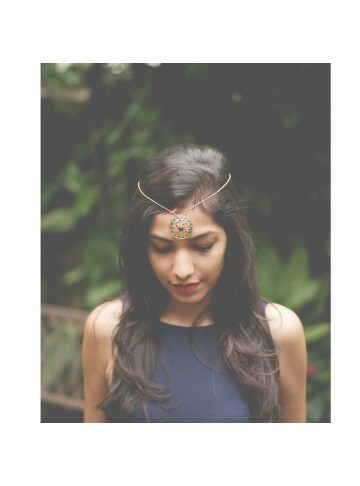 The blue Lapis and dark blue enamel will definitely make heads turn. Pair it with one of our cute earrings to complete your look. All designs in our collection have been inspired from Ancient Egypt and combined with modern motifs giving it a contemporary appeal. Turquoise stones, zircons, and deep blue enamel work make up this beautiful pendant giving it a classy look. Wear it with one our earrings from the Egyptian collection to complete your look. 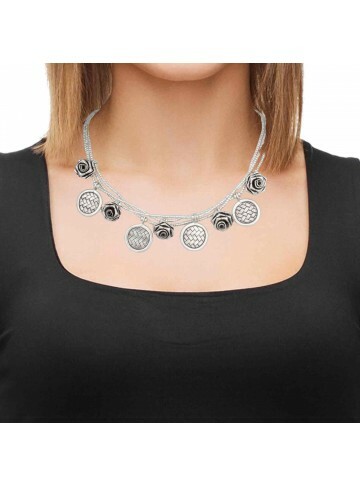 A handmade silver necklace with flattened and round beads in a two string style. Wear it with your favorite western top! If your fashion is too straightforward and you love to showcase it often, then this choker is something that you should own. The tribal inspired design and structure of this choker is something that will definitely become a centerpiece for your entire look. It will be a great addition to any basic outfit and will definitely make you the center of attention. Style Tip: Add this funky necklace to any of your informal outfits with an open neck. Butterfly, leaves and flowers make up this lovely handmade silver necklace. A striking rose quartz necklace with round silver beads interspersed beautifully. You will love owning it! Lovely white crystals in an oval flat shape are interspersed with gold toned silver beads and black tiny beads. The neutral colour will match any floral dress! A ray of colors to lift up your spirits and add a glam quotient to that pastel dress you love. Orange quartz, Jade, Black Onyx, and Silver Beads, all put together to create an elegant necklace. You will love wearing it! 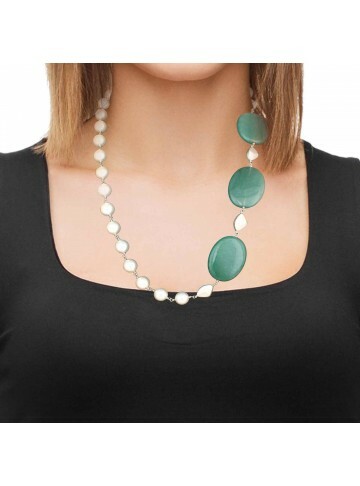 Dull silver beads, Jade Ovals and Pearls all set to adorn your neck. Creamy semi precious beads are enhanced with the play of gold plated odd shaped beads to create this unusual necklace.